The mutating conditions of the body overwhelm our screens; from television, cinema, the mobile phone and computer screen. The materiality of the body is ever present on screen – the history of Hollywood, is the history of the body – so intimate is a our relationship with the screen it can be considered an extension and outgrowth of our own biology. The screen becomes a projection of our desires, obsessions and perversions. The Screen of Flesh consists of a range of screen bodies and bodily screens. 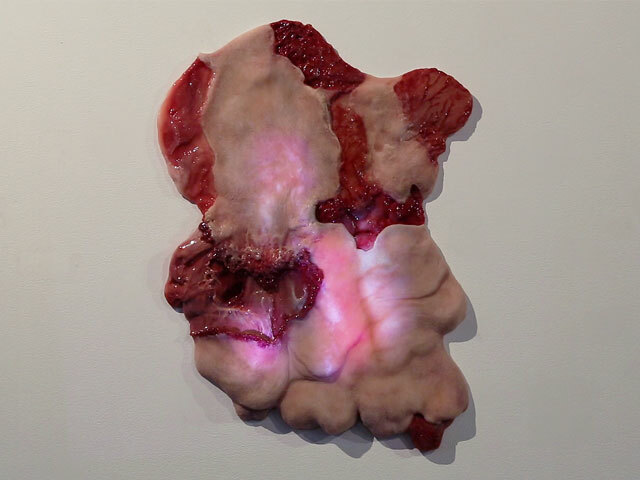 The work presents the idea that the screen along with the technology of video are implicitly connected to the body, taking the spectator into previously unseen somatic and visceral dimensions of screen bodiliness.